Fir needle oil is indeed a sacred oil and is known as the forest healer for its immaculate medicinal uses that sanctify one with an array of health benefits and heartiness. Used as a primordial remedy for treating cold, cough, joint pains and muscular cramps, this highly spirited oil purifies the air and gifts us with a heavenly and infection-free atmosphere. Fir Needle oil is extracted from the needle like leaves of Silver fir tree, scientifically known as Abies Alba. It has also been said that Fir needle oil is also extracted from the needles of the Balsam fir tree botanically called as Abies Balsamea and these trees belong to the pine family Pinaceae. Ayurveda prescribes the use of Fir Needle oil in Abhyanga, the art of Ayurvedic massaging and other remedial practices for treating rheumatism, joint pain, sinusitis, muscular cramps, skin problems and other problems associated with the lymphatic system and the respiratory system. Fir needle tree and its various extracts have a long history for its enormous remedial values. The fresh balsamic scent of this tree makes you feel like walking in a forest and reminds of the captivating Christmas Eve. Fir needles have the real power to purify the air and the soul with its disinfecting and calming properties. And it is for these great reasons; fir needles were burnt in the past after childbirth, to impart good health for the mother and the newborn. The pitch of the tree was used to treat womanly problems like menstrual irregularities. Various parts of the fir trees when mixed with other medicinal herbs were used to treat cancer, tuberculosis and rheumatism. Poultices made with Fir needles were used in folklore medicine for relieving arthritis, rheumatism and muscular pain. The gums of fir trees were used to prepare ointments to treat itches, sores, wounds, insect bites, boils and infections. The decoction extracted with the bark was used for curing kidney problems and the roots were used in the treatment of heart diseases and rheumatism. Native Americans widely used fir needles for padding the pillows for peaceful sleep and they also used it as a sudatory for women after childbirth. Fir Needle essential oil is utilized in the manufacture of cosmetic products, perfumes, bath oils, air fresheners, aerosol inhalants and incense. Ancient Egyptians used Fir needle oil to prepare hair growth formula that would elevate and energize the root of the hair when massaged onto the scalp. According to the Gas chromatography report, Fir Needle oil constitutes of 17 chemical components that contribute to its fragrance, therapeutic attributes, consistency and quality of this oil. Of which, Bornyl acetate contributes to the highest proportion of Fir Needle oil constituents with about 34% of its total composition. I believe that this must certainly help you in getting to know the exclusive information about these prime chemical constituents of Fir Needle oil. The table crafted below clearly depicts the unique nature and contributions of these biochemical constituents to the healing magnificence of Fir Needle essential oil. Fir needle essential oil has numerous effective chemical compounds and the majority of which is monoterpenes. The other constituents include sesquiterpenes, beta-pinene, delta-3-carene, alpha-pinene and terpene ester bornyl acetate, where beta-pinene and delta-3-carene have effective anti-bacterial properties. 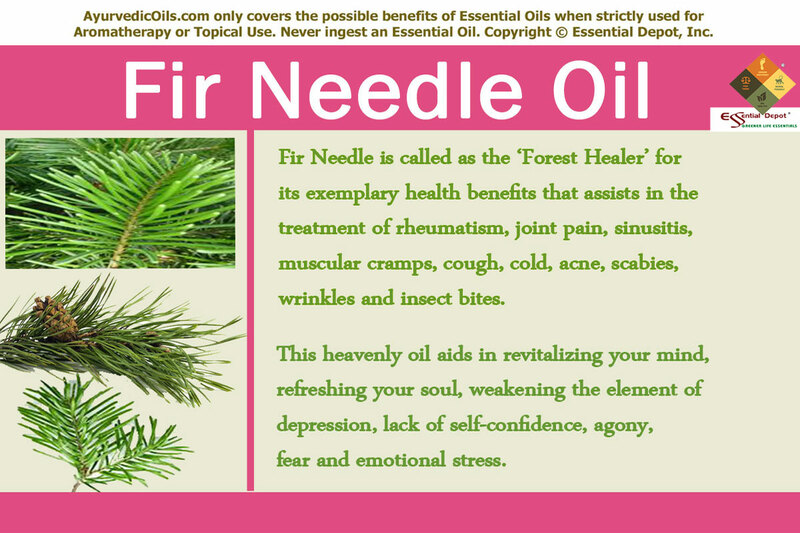 The therapeutic properties of Fir needle essential oil are anti-inflammatory, anti-bacterial, anti-fungal, antiseptic, antiviral, invigorating, stimulating, analgesic, anti-tussive, diuretic, antioxidant, astringent, energizer, aromatic, expectorant, deodorant, stimulant and tonic. Ayurveda is a common sense science that has a strong reason for everything that pertains to human health. It simply preaches that health is the outcome of one’s harmony with nature and illness occurs when things does not act in sync with nature. This 5,000 years old ancient science aims at striking balance between human health and nature with the use of natural remedies including essential oils, herbs, yoga, Ayurvedic routine, simple physical exercises, meditation and prayers. Ayurvedic treatments are not the same for every person as Ayurveda strongly believes that every individual is distinctive with a unique individual constitution just like our thumb impression. So it says that illnesses of individuals should also be treated in a unique manner. This constitution comprises of three biological energies known as doshas, namely vata, pitta and kapha. These doshas are a combination of five elements of nature, which are fire, water, air, earth and space. Just like nature, our body also has all the five elements. Where vata represents air and space and is responsible for movement. Pitta stands for fire and water and is accountable for transformation of energies. Kapha symbolizes earth and water and is in charge of structure and fluids in the body. Perfect health is determined with the balance of all these three doshas and imbalance causes illnesses. Ayurvedic remedies are involved in the act of correcting the imbalances of doshas. Fir needle oil is said to lessen kapha, pitta and vata aggravation. According to Ayurveda, respiratory illnesses occur mainly due to aggravated kapha energy, which causes water retention and excess phlegm and mucous deposits. Along with this, increased vata dosha is responsible for sinusitis, asthma and breathing problems. Fir needle oil is said to lessen both aggravated kapha and vata and for which it has been used for centuries in the treatment of cold, cough, fever, flu and other respiratory illnesses. Natural Fir needle oil inhalers are used in Ayurvedic healing for treating cold and breathing problems. The exquisite antiseptic property of this oil helps in maintaining the sanitation of the surrounding by preventing the spread of harmful microorganisms, which are among the primary reasons for respiratory infections. 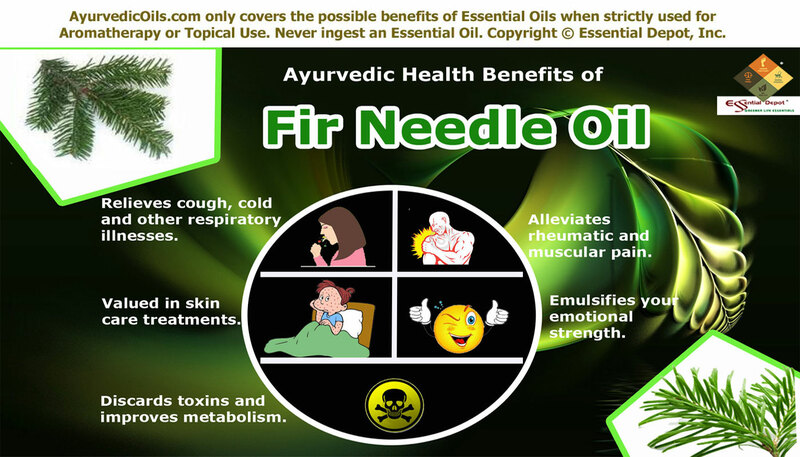 Fir Needle oil has antitussive properties that acts as an effective cough suppressant. As a refreshing expectorant, this oil loosens the mucous and the phlegm deposits in the lungs and respiratory tract, thus cleansing the respiratory passages and speeding up the recovery process. Adding 2 drops of Fir needle oil in steam inhalation and inhaling the pine-forest aroma assists in clearing blocked nasal passages, preventing the inflammation of the respiratory organs, alleviating breathing difficulties, treating bronchitis and it helps in maintaining clear sinuses. Mix 2 drops of Fir needle oil with 1 ml coconut oil and rub it gently on your chest, back and throat for helping with nasal congestion, runny nose, sneezing, cough and flu. Add 3 to 4 drops of Fir needle oil in warm bathing water for feeling light and re-energized as respiratory infections generally make the body feel heavier and drowsy. Fir needle oil has anti-inflammatory, analgesic and diuretic properties that soothes and eases pain and inflammation associated with arthritis, rheumatism and muscular tension. Also known as Silver Fir, the essential oil of Fir is extremely soothing to joints and muscles and acts as an effective aid in lessening pain and inflammation. With its kapha reducing properties, massaging 3 drops of Fir needle oil mixed with 1.5ml of sesame oil on the painful areas aids in treating water retention, discharging detrimental toxins, salt and other micro-organisms in the body through urine and sweat, reducing inflammation and alleviating pain with its powerful analgesic values. You can also add 3 to 4 drops of Fir needle oil in hot compress or in warm foot bath for decreasing pain and promoting relaxation. Fir needle oil has been in use since the primordial times to protect the skin and retain its natural glow. The astringent properties of this oil is effective in treating acne, injuries, infections, sores, wounds, cuts, mild allergies, insect bites etc. The anti oxidant properties of Fir needle oil fights against the free radicals and prevents premature aging. Mix 2 drops of Fir needle oil with 1 ml jojoba oil or to your regular skin care cream and apply it on the affected areas in circular movements. This stimulating application to the skin results in mild coagulation of the skin proteins, thus elevating it natural beauty and retaining its youthfulness. Fir Needle oil is often recommended by dermatologists and Alternative medicine experts in the treatment of psoriasis, itching, pimples, eczema, skin diseases, poor skin, scabies and sores. This is mainly due to the presence of antiviral, anti-bacterial, anti-fungal and antiseptic properties of this oil. A 2006 study on ‘Composition and antibacterial activity of Abies balsamea essential oil’ published in PubMed states that the three constituents in Fir needle oil namely alpha-pinene, beta-caryophyllene and alpha-humulene were effective against the gram negative and gram positive bacteria including Staphylococcus aureus and Escherichia coli, where Staphylococcus aureus is mainly responsible for wounds and other skin infections to turn septic and worsen. Your success depends upon your mental strength and amidst the stress and tension of this contemporary world, nothing better than the natural remedies like essential oils can grant us the real peace and serenity. Fir needle oil is a boon to mankind with its rich invigorating, stimulating and energizing properties contributing to a potential uplift of the emotional strength. 2 to 3 drops of Fir oil added to your diffuser or burner can act as a mood elevator that aids in revitalizing your mind, refreshing your soul, weakening the element of depression, lack of self-confidence, agony, fear and emotional stress. Being a diuretic, Fir Needle Oil is helps in eliminating the toxic remains, uric acid, fat deposits and salts in the body through urine by stimulating the frequency and quantity of urine. Massaging your body with 10 drops of Fir needle oil mixed with 10ml of coconut oil can improve the health of the kidneys, treat kidney stones or renal calculi, urinary infections, food poisoning by enhancing the functions of the excretory system and boosting the metabolic functions naturally. Fir needle oil is also used in manufacturing soaps, perfumes, air fresheners, hair oils, body lotions etc. It can also be used on pet animals as it is a non-toxic repellent of fleas. Certain research studies have also proved the antitumor activity of Fir needle oil by the production of reactive oxygen species induced by alpha-humulene as possible mechanism of action. This is only for the purpose of information and is not meant for diagnosis or as a replacement for prescribed drugs or professional medical advice. Never use essential oils internally and topical use should always be in a diluted manner as pure and organic essential oils are highly concentrated extracts and can cause harm if used directly on the skin. It is advisable to consult your Ayurvedic practitioner before making the right choice of essential oils for your unique health condition and individual constitution. The MSDS (Material Safety Data Sheet) of Fir Needle oil is readily available for your enhanced safety and better usage. 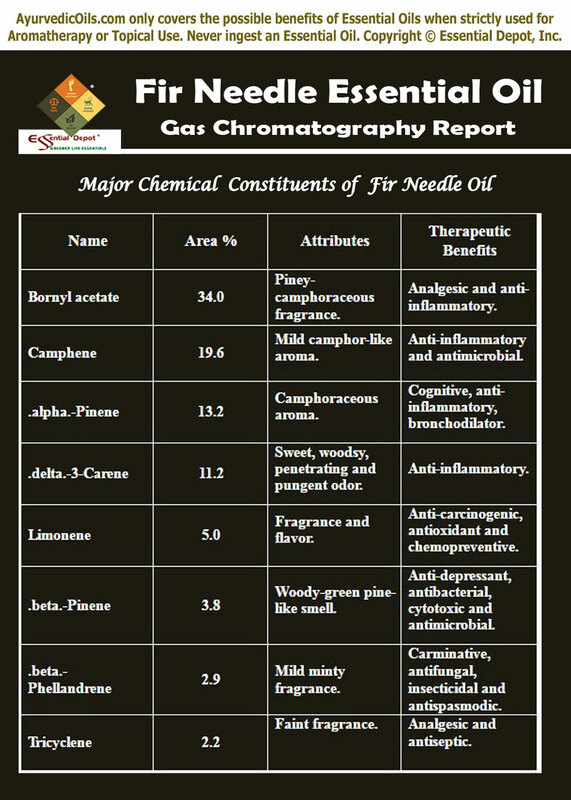 Gas Chromatography Report (GC analysis) of Fir Needle oil. This entry was posted in Essential Oils - Learn About and Purchase and tagged Abies alba, Abies balsamea, Ayurvedic health benefits of Fir Needle Oil, Ayurvedic oils for arthritis, Ayurvedic oils for bronchitis, Ayurvedic oils for common cold, Ayurvedic oils for kidney stones, Ayurvedic oils for mental clarity, Ayurvedic oils for muscular pain, Ayurvedic oils for respiratory problems, Ayurvedic oils for rheumatism, Ayurvedic oils for sinusitis, Ayurvedic oils for skin care, Ayurvedic oils for stress, Ayurvedic oils for urinary infections, Balsam Fir oil, Chemical constituents of Fir Needle Oil, Christmas tree, Fir needle essential oil, Fir Needle oil in Ayurveda, Fir oil, Gas Chromatography report of Fir Needle oil, Health benefits of Fir Needle Oil, MSDS report of Fir Needle oil, Safety data sheet of Fir Needle oil, Therapeutic properties of Fir Needle Oil by AyurvedicOils. Bookmark the permalink.